Foot problems are a big issue in Europe, where 35% of the population suffers of some troubles with their feet. Orthopaedic treatment is an effective and sometimes even the only way to solve these complaints. Another European problem is the increasing costs of healthcare. This gives both a chance and a risk for the footcare trade, which is aiming at improving the quality of its treatment as well as decreasing of production costs. Innofoot is a European project set-up to develop innovations in the treatment of foot disorders. The main goals of the project are 1. to increase the competitiveness of the orthopaedic shoe sector by decreasing production costs and 2. to realise a more controllable improved quality of care. The project aims at treatment of patients, design of products, innovative materials and cost reduction of production methods. 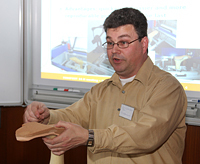 Innofoot is a cooperative research project, which a consortium consisting of 5 associations, being the NVOS from the Netherlands, APIndustria from Italy, Czech Footwear Organisation (CFO), and Gremicat and Asoan both from Spain. Besides these associations 12 companies are involved, of which 4 from Spain, 2 from Slovenia, 2 from Italy, 2 from the Netherlands, 1 from the Czech Republic and 1 from Litowania. The Dutch companies are Wittekamp & Broos and Büchrnhornen. The project is being coordinated by TNO from the Netherlands. The other research institutes involved are Instituto de Biomecánica de Valencia (IBV) and Aimplas from Spain, University of Perugia (Unipg) from Italy and Tomas Bata University) UTB from the Czech Republic. The project is now two years in progress and the research activities are almost finalised. In February a project meeting was held at the UTB in Zlin, Czech Republic, which is a place with an enormous history in the field of shoemaking by the company of Bata. The project results so far and the planning for the last year, presented during this meeting, will be described below. Aimplas is working on a new concept based on so called ‘active materials’, which are materials which respond to pressure. The first results have been shown and look interesting. Further details are confidential for the time being. Our second Spanish research institute has developed a knowledge system (KMS)which is an application created for footcare specialists such as chiropodists, orthopaedic technicians or foot surgeons, in order to improve the biomechanical assessment of patients, as well as the prescription, development and evaluation of shoes, insoles and orthotic solutions.. The system aims at giving advice to experts and less experienced orthopaedic shoemakers, although it will never replace these experts. After the Alpha version of the system, the Final one has already been developed and it will be checked in the next period. The KMS will become available for all European orthopaedic shoemakers via internet as soon as the partners have released it. For the activities regarding new and cost effective production methods TNO is cooperating with the Dutch companies Wittekamp en Broos en Büchrnhornen in order to develop a CAM/CAM system for the automatic production of orthopaedic insoles. A supplement milling machine has been developed for milling the bottom part of the insole and has been tested at Wittekamp en Broos. During the test the clamping of lasts in the machine appeared to be a bottleneck. This has been solved by designing a new clamping device which can easily be used with the lasts. The result of this new production method is a much higher reproducibility of the insole. If a patient needs a new insole and/or a new shoe after a period of time, this insole will be the same as the first one. During the tests at Wittekamp en Broos it was concluded that also the software would need an upgrading, resulting in a better check ‘on screen’ of what will be milled. This adjustment will take place in the next period. The economical analysis can therefore not be fully completed yet at this moment, but the first indications show that an decrease of labour time of 40% can be realised with these developments. Besides the milling process, TNO is studying the possibilities of Rapid Manufacturing (RM) for orthopaedic insoles and ortheses. Technically a lot of possibilities already exist, but the quality of the RM products seems not good enough yet for orthopaedic shoe products. Besides that, material costs are still high and CAD-modelling is time consuming (as far as CAD-models already exist). So, according to TNO it will take some time before RM will become interesting for the orthopaedic shoe sector. The last year of the project will be mainly aimed at integration and evaluation by the companies, knowledge transfer and development of training tools. In the next months five cases will be performed in which the new technologies are integrated. For each case a foot disorder is selected and worked out in detail by several partners from intake to solution and validation of this solution. The cases will be presented as show cases by the end of the project. 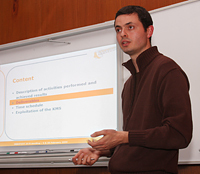 NVOS, UTB and IBV will take care of the development of a training tool and its contents. Training modules will be based on books published by the NVOS as well as the results from the project, like the KMS. After testing by the partners, the training tool will become available via internet. 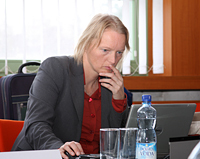 All partners of the project have a task in dissemination, or knowledge transfer. During the IVO2009 in Den Hague for example, the results of the project will be presented in workshop and presentation. More information about Innofoot can be found on www.innofoot.eu.